Sally has wanted to be a doctor for as long as she can remember and, whilst being an active member of the school community and Spanning House Captain during her sixth form years, focussed on gaining admission to medical school during her time at Queen Elizabeth’s, with the support of many teachers and staff. Despite receiving an offer to study medicine at Lancaster University, unfortunate extenuating circumstances during her A-Level examinations led to her taking an unexpected foundation year (Pre-Medical Studies) at Lancaster instead. She excelled on the course and gained more confidence and experience, easily meeting offers from three different medical schools. She decided to remain at Lancaster University and began her medical training in October 2016. 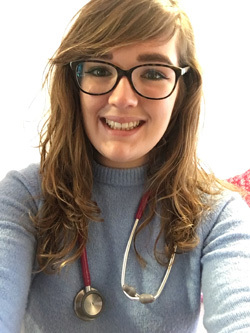 Sally is enjoying her medical studies and performing well, focussing this year on anatomy, medical sciences, communication skills and mastering core clinical examinations. In her subsequent clinical years, she will embark on a curriculum consisting of hospital and GP rotations, as well as supplementary teaching at the university. Her favourite part of the course so far has been interviewing patients with chronic illnesses in a GP setting to learn about how co-morbidities affect lives whilst practicing communicating with patients. Sally is also an active member of the medical school community, having recently been appointed as co-coordinator of Lancaster MedSoc’s Teddy Bear Hospital. This sub-society involves students visiting local primary schools to treat and diagnose children’s teddy bears, with the aim of helping children feel less scared of doctors and visiting hospital. Sally is looking forward to progressing through the medical degree and eventually graduating as a doctor. She is an aspiring paediatrician and hoping to continue working in the North West after finishing her degree. Sally is keen to act as a mentor to students who are considering careers in healthcare sciences or applying to medical school and hopes her experiences prove that, even if you don’t succeed the first time, if you are determined and work hard you can achieve your dreams. If you wish to contact Sally please email Miss Francis. for her address.